Our most popular Personalized Christian Gifts and Custom Religious Gifts are all right here in one location. Simple pick one of these wonderful Top 10 Christian Gifts and fill in your personalization, we will take care of the rest. All of our Top 10 Religious Gifts have been selected by our loyal customers as great personalized gifts for any special religious occasion. A child's confirmation is a sacred time. 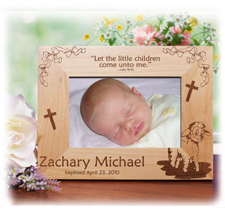 These engraved Confirmation personalized wood picture frames are a way to remember the blessed event forever. 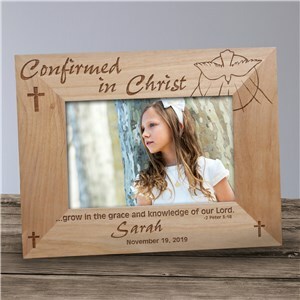 Your Confirmation personalized wooden picture frames read Confirmed in Christ and will be beautifully engraved with your child's name (up to 30 characters) and the date of the momentous occasion. 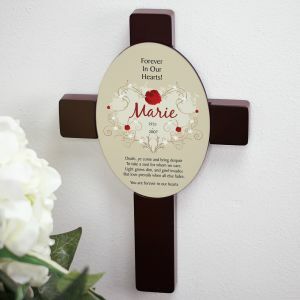 This personalized Confirmation frame — which is available in a horizontal or vertical design and your choice of three sizes (4" x 6, 5" x 7" and 8" x 10") — includes an easel back for tabletop display. 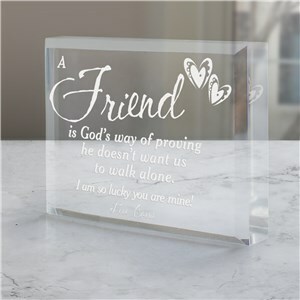 Express your love for your friend by giving this beautifully engraved personalized friendship keepsake. Distance & time will never separate the love you have for one another; that love is expressed in this one-of-a-kind Personalized Friend Keepsake. This engraved keepsake may be engraved with any one line message. The words Family, Togetherness, Love & Support all come to mind when you see this absolutely stunning Personalized Sweatshirt for your Mom, Grandmother or Nana. 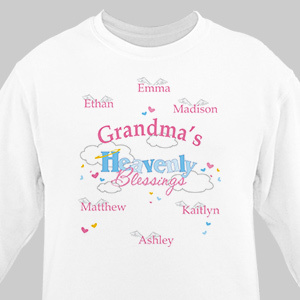 These comfortable Personalized Grandma Shirts proudly show off the family in either a soft pink or white. Your Personalized Shirt for Mom or Grandma is available on our premium cotton/poly blend Sweatshirt, machine washable in adult sizes S-3XL. Available in White, Pink or Ash Gray. Includes FREE Personalization. Personalize your Mother's Day Sweatshirt with any title; Mom, Grandma, Nana, Great Grandma, Gram, Granny, Nonna, Abulea, Babcia, you choose or create your own and up to 30 names. 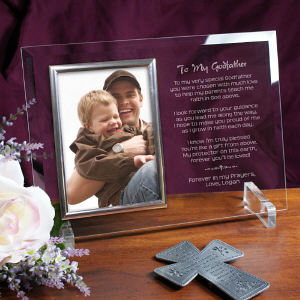 All of our Top 10 Personalized Christian Gifts can be personalized with your custom message to add that special touch. GiftsForYouNow.com has thoughtful Personalized Christian Gifts suitable for your upcoming event. 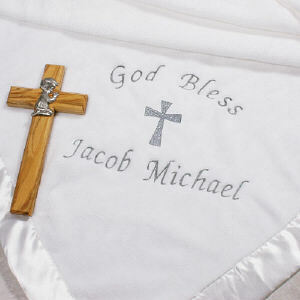 We have unique Godparent Gifts, Personalized Christian T-shirts, Custom Printed Christian Coffee Mugs and Personalized Christian Keepsakes all selected by our valued customers as the best Personalized Christian Gifts.